Your web page has a good impression if its loading time is shorter, visitor may captivated in your site and get information ease-fully, little delay break your connection with your visitor. You can do many things for that but caching will give you best impact to improve your site’s speed. First you should know about Caching. Short time memory storage is Cache which can used to store your recent browser data. When a site is cached, it means the site’s pages, images, files and Web objects are stored on the user’s local hard drive. If user wants to frequently access his visited site’s it can provide all cached data like back support in page loading cache plugins perform same thing to improve loading speed of page. WordPress provides multiple cache plugins to make your site speed perfect. In this blog we are going to describe five best wordpress cache plugins. It has multiple abilities like Page Cache, Database Cache, Browser Cache, Object Cache, reducing the download times and providing transparent content delivery network (CDN) integration and more. Improvements in search engine result page rankings, especially for mobile-friendly websites and sites that use SSL made it most famous in all plugins. W3 Total Cache Compatible with shared hosting, virtual private / dedicated servers and dedicated servers / clusters. WP Rocket is tremendously user-friendly and doesn’t require you to mess with any advanced configuration settings. It is probably the most simplest WordPress cache plugin for anyone to configure. In WP Rocket you can clear the cache for your website and also preload the cache. I would like to suggest you to get a single site license of WP-Rocket plugin and try it on your blog or site and notice the difference. WP Super Cache is another highly popular free WordPress caching plugin. Developers love WP Super Cache as a caching plugin because it’s easier to setup and has less compatibility problems meanwhile providing multiple features for instance Page compression and dynamic caching, support for Content Delivery Networks (CDN), Caching for visitors using a mobile device, Scheduler to manage deletion and re-caching at given intervals. It has ability to caching secure, up-to-date and efficient for years to come. WP Most expeditious Cache prides itself on providing an easy-to-install plugin. Most popular features providing Wp Fastest Cache are Mod_Rewrite which is the fastest method is used in this plugin. All cache files are deleted when a post or page is published. It Supports CDN and SSL, Enable/Disable cache option for mobile devices and logged-in users, block cache for specific page or post with Short Code. If you are probing for a popular, free, and highly vetted caching plugin with an abundance of customization options, WP Super Cache is the plugin for you. Comet Cache integrates the impeccable bend of speed, simplicity, and reliability. It’s simple, efficacious and there’s NO learning curve, compatible with WooCommerce and any other WordPress E-Commerce plugins. Most famous features are automatic caching of your entire site, supports RSS feed caching, ability to manage your cache expiration times and GZIP compression. Comet Cache can now be configured to automatically clear the cache for date-based. Furthermore Apache Optimizations now include a new option that allows site owners to enforce an exact host name for all requests. Selecting Comet Cache will be one of your best choice. You can also download Comet Cache from wordpress.org for free. In this blog we have tried to represent five best WordPress cache plugins which may help you to decide best cache plugin for your site or a blog and make your site load time less as your costumer wants and will make bridge between you and your visitors. We know that every site is a little different, and your particular setup or theme might require a different variety of caching but you may select in mentioned plugins which may succor to minify your site loading time. 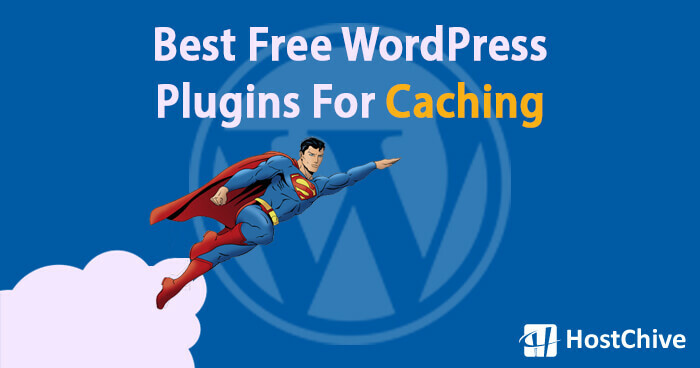 Hope this blog will help you to decide the Best Free WordPress Plugins For Caching.